Top Gun has always been great to work with. Great quality products are supported by a knowledgeable, professional staff. The Sig Sauer e2 grip is a welcomed addition to an ever improving line of products engineered to make the Sig shooting experience the most enjoyable and rewarding as possible. 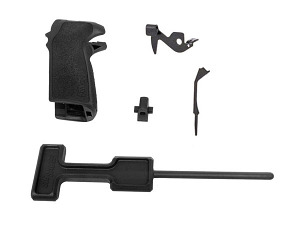 The e2 grip kit comes with everything you need to install the grip once the factory grips. Start to finish the removal and installation takes less than 5 minutes. Once the e2 grip is installed the gun feels like a different gun all together. You should notice faster sight alignment for faster first roun on target and a much faster follow up. Recoil management is greatly enhanced by producing better hand to grip contact. The texture is aggressive but doesn’t snag up on clothing. If you want to improve your shooting experience by increasing control of the gun, the e2 grip is change you should try. Your service was excellent. I have not installed the parts yet but it was a pleasure to deal with you. Great product. Feels way better than original grips . Fast shipping and top notch customer service. Great grip very egronomic great for small hands grip feels like it's been stippled. After seeing a you tube video on this product, I thought it might e just what I needed. These grips feel much better in my hand. Installation was fairly straight forward. While I had it apart I also changed the hammer spring to an 18# I found that the new hammer strut reduces the DA poundage by 2.5# and didn't really affect the SA. The 18# spring only reduced it another half pound. The big difference is the feel. DA pulls so much smoother. I recommend this product.